The result: monstrous economic and social inequality. Mexico is one of the countries with the greatest disparities between wealth and poverty in the world. According to a 2015 article written by Gerardo Esquivel, a professor at the College of Mexico and a Harvard graduate, 10 percent of Mexicans control 64.4 percent of the national income, and 1 percent own 21 percent of the country’s wealth. But most significantly, inequality in Mexico deepened precisely during the neoliberal period. Privatization allowed it to thrive. It’s also important to make note of the following statistic: in July 1988, when Carlos Salinas was imposed as president on the Mexican people through electoral fraud, only one Mexican family sat on the Forbes list of the world’s richest people — the Garza Sada family, with $2 billion to their name. By the end of Salinas’s term in office, twenty-four Mexicans had joined the list, owning a combined total of $44.1 billion. Nearly all had made off with companies, mines, and banks belonging to the people of Mexico. In 1988, Mexico sat at twenty-sixth place on a list of countries with the most billionaires; by 1994, Mexico was in fourth place, just beneath the United States, Japan, and Germany. As is readily observed, economic inequality today is greater than it was in the 1980s, and perhaps greater than the periods before, though a lack of accurate records makes such comparisons difficult. Although Esquivel doesn’t highlight it, inequality skyrocketed during Salinas’s term, when the transfer of public goods to private hands was at its most intense. Under Salinas, the divide between rich and poor deepened like never before. Salinas is the godfather of modern inequality in Mexico. It’s clear, then, that privatization is not the panacea that its proponents would have us believe. If it were, beneficial effects would by now be visible. At this juncture it’s fair to ask neoliberalism’s supporters: how have Mexicans benefited from the privatization of the telecommunications system? Is it a mere coincidence that, in terms of price and quality, both phone and internet service in Mexico rank seventieth worldwide, far below other members of the OECD? What social benefits has the media monopoly conferred — other than to its direct beneficiaries, who have amassed tremendous wealth in exchange for protecting the corrupt regime, through brazenly slanted coverage of opposition candidates? What have we gained through the privatization of [Mexican state railroad company] Ferrocarriles Nacionales in 1995, if twenty-plus years later these outside investors haven’t built new train lines, and can charge whatever they want for transport? How have we benefited from the leasing out of 240 million acres, 40 percent of the country (Mexico has 482 million acres total) for the extraction of gold, silver, and copper? Mexican miners earn, on average, sixteen times less than those in the United States and Canada. Companies in this field have extracted in five short years as much gold and silver as the Spanish Empire took in three centuries. Most outrageously, up until recently they were extracting these minerals untaxed. In short, we are living through the greatest pillage of natural resources in Mexico’s history. This destructive policy has done nothing for the country. Statistics show that in the past thirty years we’ve failed to advance. To the contrary, in terms of economic growth we’ve fallen behind even an impoverished country like Haiti. The only constant has been economic stagnation and unemployment, which has forced millions of Mexicans to migrate or to make a living through the informal economy, if not resorting to crime. Half of the population is precariously employed with no safety net. For these reasons, it’s illogical to think we can end corruption through the same neoliberal political and economic approach that has so patently failed in the past. To the contrary, until there’s a deep and sustained change, Mexico will continue its decline. Our present course is unsustainable, and we are nearing the point of complete collapse. Our political economy today echoes the failures of the Porfiriato period at the end of the nineteenth century, when the prosperity of a few was placed above the needs of the many. That failed experiment culminated in armed revolution. The need to topple the PRIAN oligarchy and their ilk has never been greater, just as happened with Porfirio Díaz. But this time around we will not descend into violence, acting rather through a revolution of conscience, through an awakening and an organization of the pueblo to rid Mexico of the corruption that consumes it. We must ensure that the democratic state, through legal means, distributes Mexico’s wealth equitably, subject to the premise that equal treatment cannot exist without equal access, and that justice consists of giving more to he or she who has less. An excerpt from A New Hope for Mexico (2018), translated by Natascha Uhlmann and published in the UK and Commonwealth (minus North America, India, and Pakistan) by Pluto Press and in North America by OR Books. 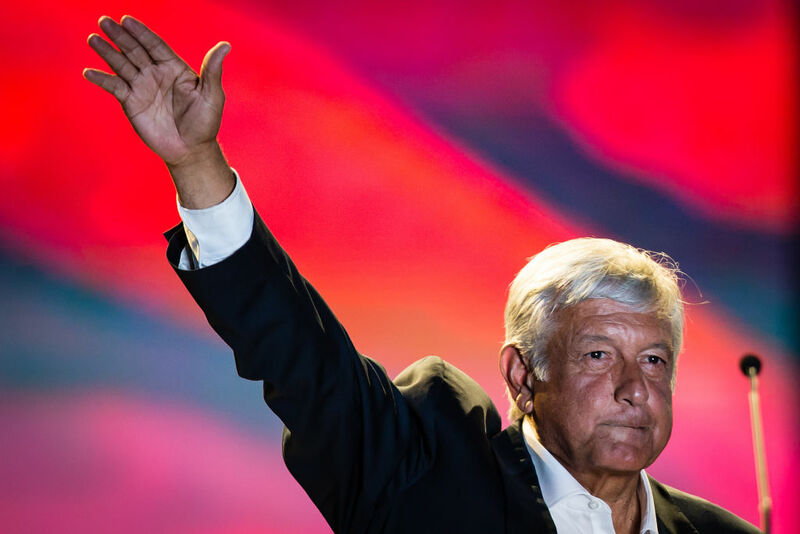 Andrés Manuel López Obrador is the president-elect of Mexico.